Clinical Details : 8 yo female, product of a consanguineous marriage, now one months history of difficulty walking, examination shows masking of facial expression, rigidity in both arms and legs, left plantar extensor. 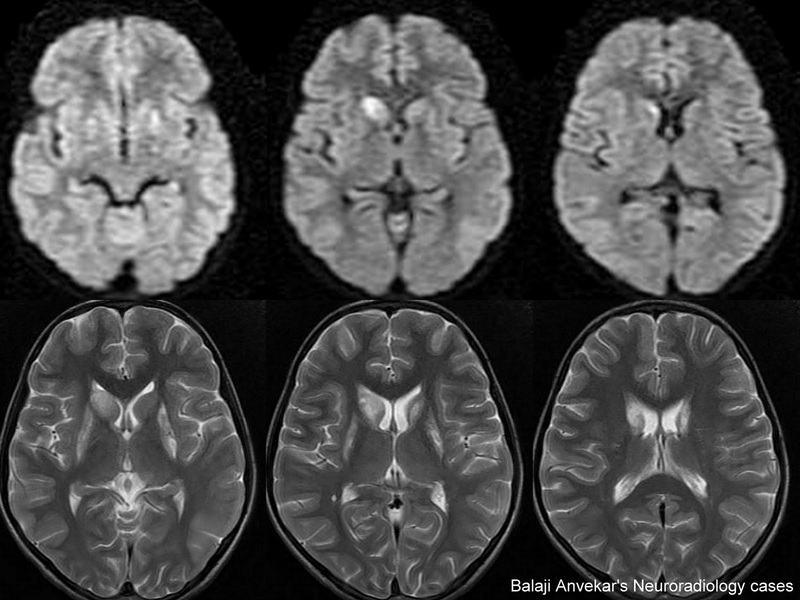 MRI Brain Diffusion and Axial Tw images. 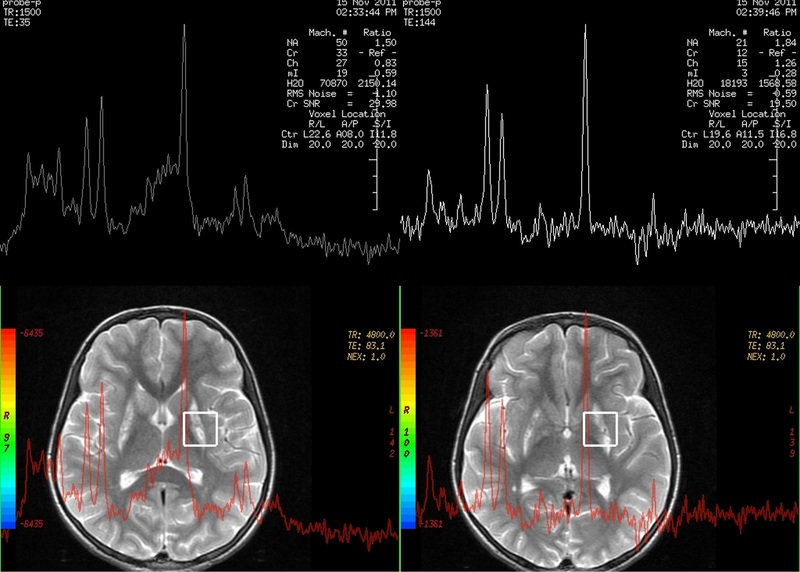 Single voxel MRI Spectroscopy at short TE of 35 and long TE of 144 ms. Bilateral symmetric T2 hyper intensity with faint high signal on diffusion involving putamen and caudate nuclei. An upright Doublet of lactate at 1.3ppm on short TE of 35 ms with inversion at long TE of 144 ms on MRS. 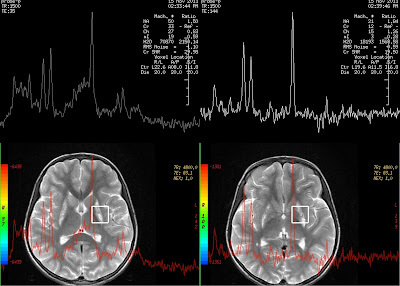 Genetically heterogenous mitochondrial disorder characterized by progressive neuro degeneration. Bilateral symmetrical involvement of Basal ganglia ( Putamen > Caudate > Globus pallidi), thalami, Brain stem (substantia nigra of mid brain > Pons > Medulla), Dentate nuclei of cerebellum, Periventricular white matter. 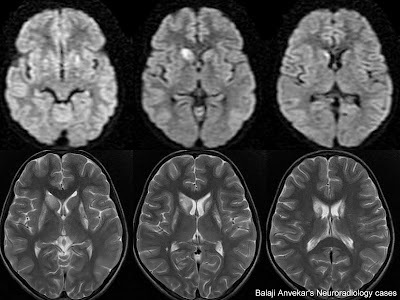 Hypodense on CT and T2 hyperintense on MR with restricted diffusion in acute stages. Raised Choline, reduced NAA and Lactate peaks on MRS. Gender : No specific predilection. Most common signs and symptoms: Psychomtor delay, regression, hypotonia, Ataxia, Ophthalmoplegia, ptosis, vomiting, swallowing and respiratory difficulties, dystonia, seizures. Prenatal Diagnosis: possible with chorionic villus sampling.